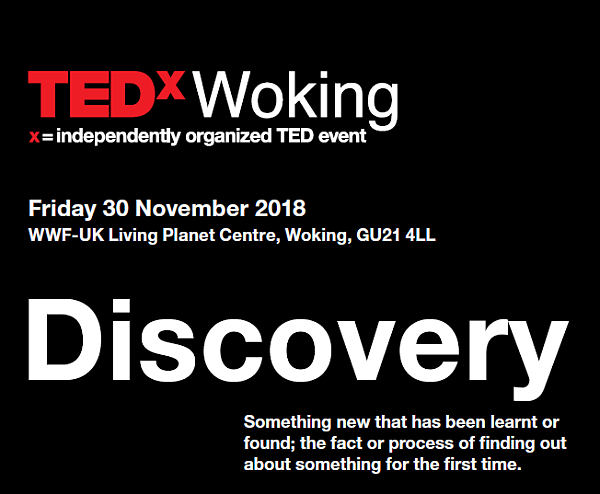 TEDxWoking is a unique gathering in our community that will unleash new ideas, inspire and inform. We were delighted to welcome local experts in their field, who will be sparking deep discussion on such diverse topics as: Eating the World - how our food is the gravest threat to life on earth; and Self Discovery - the real legal high. Meet our speakers and watch their talks here. Discover more about our exciting line up of speakers. We're please to be returning to the WWF UK Living Planet Centre. TEDx is a programme of locally organised events that bring the community together to share a TED-like experience.